Whether you’re snorkeling in Hawaii’s tranquil waters, admiring the spectacular beauty of Kauai, or just relaxing on the warm sands of Waikiki Beach, no one brings out Hawaii’s best like Globus. From Pearl Harbor’s famous Battleship Row to a festive luau with authentic Polynesian dancing, Hawaii’s allure to vacationers is powerful indeed and on this Hawaii tour, you’ll visit Oahu, the Big Island of Hawaii, Kauai, and Maui—along with their most famous attractions. Feel the sand in your feet as the ocean waves roll over them, and marvel at the black-sand beaches on Hawaii’s Big Island. Watch the surfers attempt to master the waves in Waikiki Beach. Be mesmerized by the pineapple and sugar cane fields, and thoroughly savor Kona coffee, some of the best coffee in the world! Revitalize your spirit at Kauai’s Waimea Canyon, the “Grand Canyon of the Pacific;” Maui’s Haleakala National Park, with its volcanic landscapes and sub-tropical rainforest; and Hawaii Volcanoes National Park, where you’ll learn about this active volcano. On this Hawaii tour, Globus has also arranged some out-of-the-ordinary experiences for you. In Kona, sample the famous Hawaiian sweetbread at a Punalu’u Bake Shop. Coffee fans will enjoy visiting the Kona Coffee Living History Farm, where you’ll learn about Kona’s coffee industry, and Kauai Coffee Company, Hawaii’s largest coffee plantation. All of this and more await you in the tropical paradise of the Hawaiian Islands. So let Globus handle all the details on this Hawaii tour while you relax, capture photos, savor the food, and enjoy yourself on this amazing vacation! 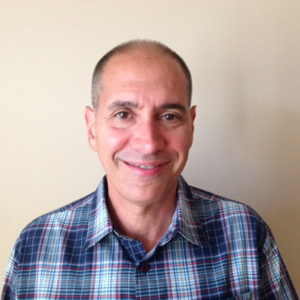 Participation in this tour requires client’s name exactly as it appears on his/her passport, D.O.B., gender, and nationality at the time of booking. Upon arrival to the island of Oahu, you are greeted in the traditional Polynesian way—with a warm aloha and a LEI of fresh flowers. Transfer to your hotel in Waikiki. The remainder of your day is at leisure. A breakfast get-together with your Tour Director reviews activities scheduled throughout your stay. Next, a tour of PEARL HARBOR’s famous Battleship Row. Listen to a narration of the dramatic air attack of December 7, 1941, and visit the USS Arizona and the impressive MEMORIAL dedicated to the 1,102 men still entombed. You will also have an opportunity to visit the MUSEUM, an excellent way to learn about Pearl Harbor Day, the Japanese strategy and military craft, and the individuals involved in the attack. Then, on to Punchbowl National Cemetery with its beautiful views of Honolulu. Other sights include Chinatown, the Hawaii State Capitol, royal ‘Iolani Palace, and the statue of Kamehameha the Great. Tonight, enjoy an included dinner at your hotel. Today is free to relax, swim, enjoy water sports, or laze on the beach. 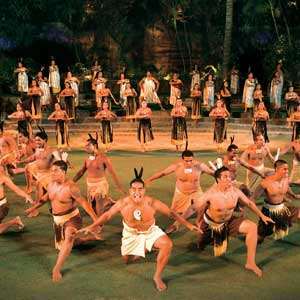 Take the optional excursion to the Polynesian Cultural Center for authentic island arts, crafts, history, music, a dinner buffet, and a spectacular Polynesian show with more than 100 performers. This evening, enjoy an optional sunset cruise with dinner, Hawaiian cocktails, and splendid views of the glittering Waikiki coastline and Diamond Head. Board a morning flight to the “Big Island” of Hawaii. Upon arrival in Hilo on the east coast, drive to HAWAII VOLCANOES NATIONAL PARK. Here, see Kilauea Crater, rising 4,090 feet above a volcanic wonderland of steaming fire pits, lava tubes, and fern forests. Next, enjoy an included lunch followed by a stop at PUNALU’U BAKE SHOP to sample the famous Hawaiian sweetbread introduced to the area by Portuguese sugar workers in the 19th century. This traditional favorite is not to be missed! Continue on to Kona, your home for the next three nights. This morning, visit the KONA COFFEE LIVING HISTORY FARM, a working coffee and macadamia nut farm, where you have the opportunity to learn about the history of Kona’s coffee industry and the remarkable pioneers who established these farms. Tonight, join your Tour Director for a festive LUAU. You’ll have the chance to learn to hula, try some traditional Hawaiian specialties like poi, and see captivating performances by Polynesian musicians and dancers. Today is free for independent activities. 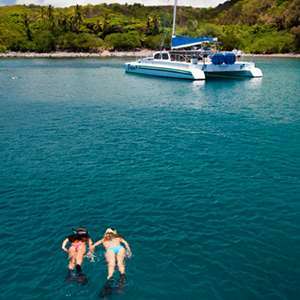 Find a special place to relax poolside and enjoy the warm tropical sun and balmy breezes, enjoy an optional snorkeling cruise to Kealakekua Bay, or join the optional helicopter flightseeing excursion. 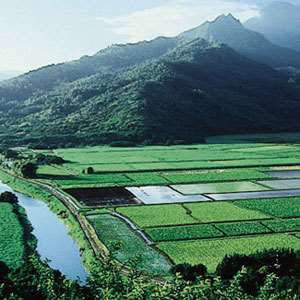 A scenic flight to the “Garden Isle” of Kauai, whose lush landscapes featuring orchids, hibiscus, and plumeria are often used as a setting for Hollywood films depicting tropical paradise. Upon arrival, proceed to KILOHANA PLANTATION and join your Tour Director, who hosts a special lunch. Afterward, enjoy a narrated TRAIN RIDE which takes you on a tour of the historic plantation that passes through fruit orchards, lush gardens, and tropical farmland. 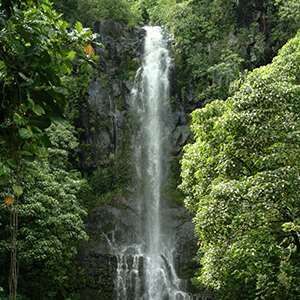 Next, view pretty `Opaeka`a Falls on the Wailua River before continuing to your resort. Spend the day as you please! Take in refreshing ocean breezes from the beautiful white-sand beaches, immersing yourself in the heart of the island’s beauty. No activities have been scheduled today to give you time to relax and enjoy your oceanfront resort. 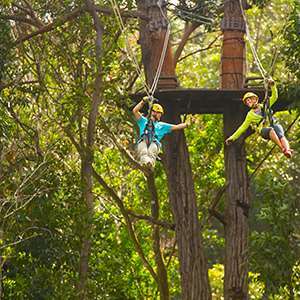 Optional tours include helicopter flightseeing or a zipline adventure in the mountains. Drive to Waimea, once the Polynesian capital of Kauai and the site where Captain Cook landed in the islands in 1778. Sightseeing highlights include WAIMEA CANYON, the “Grand Canyon of the Pacific,” and Hanapepe Valley. A stop at the largest coffee plantation in Hawaii, KAUAI COFFEE COMPANY, includes time at the visitor center, where you can learn about coffee production and the history of the Kauai Coffee Company. En route back to your hotel see SPOUTING HORN, the famous blowhole created from a lava tube. Spend your last evening on Kauai relaxing at the resort, exploring further, or indulging yourself in some souvenir shopping. A morning flight takes you to the “Valley Island” of Maui. Drive to the lush `IAO VALLEY to see the `Iao Needle, a spectacular volcanic spire. 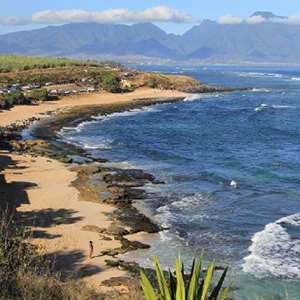 Visit LAHAINA, then continue on to Ka`anapali, your home for the next three nights. The balance of the day is at leisure. Activities abound and your Tour Director is on hand to help you plan your day. Enjoy a full free day to swim and sunbathe at the beach or hotel pool. Another choice is the “Road to Hana,” one of the world’s most impressive drives, with 54 bridges and numerous waterfalls. From mid-December to mid-April, a humpback whale-watching cruise is available. Enjoy a final free day in Maui. Perhaps take an optional excursion to Haleakala National Park, site of the huge volcanic Haleakala Crater, known as the “House of the Sun.” In 1980, this native ecosystem of cinder cones and dense rainforest was designated an International Biosphere Reserve. There’s plenty of time in the afternoon to relax and enjoy your hotel’s facilities and beach. Explore the rich heritage of the Pacific Islands at the Polynesian Cultural Center, a location that for over 50 years has helped to preserve and portray the cultures, art and crafts of the people of Polynesia. Depending on level of interest, visitors can explore the various authentic villages, take part in activities or games and enjoy a variety of dinners and shows. 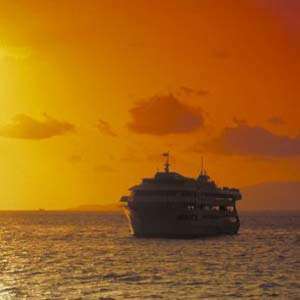 Enjoy an evening cruise and dinner show as you discover the unparalleled vistas of Waikiki and beyond Diamond Head to view the beautiful Kahala Gold Coast. 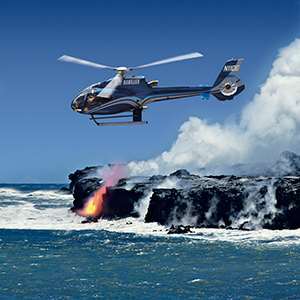 If you think a land or aerial tour of Hawaii provides spectacular scenery, try taking in the views just below the ocean's surface. Immerse yourself in stunning private waterfalls, tranquil streams, scenic coastlines and rugged valleys on this North Kohala adventure. 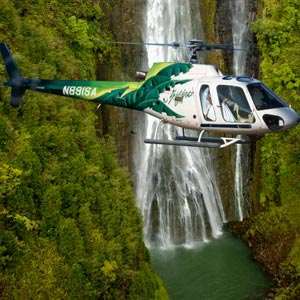 Choose from two stunning helicopter tours over the Big Island and a choice of two different types of helicopter aircraft. 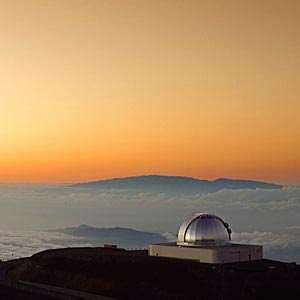 Journey from sea level to the nearly 14,000 foot / 4267 meter summit of Maunakea reveals the wonders and world-class clarity of the Hawaiian night sky. Experience the view from above in the comfort of a state-of-the-art helicopter. 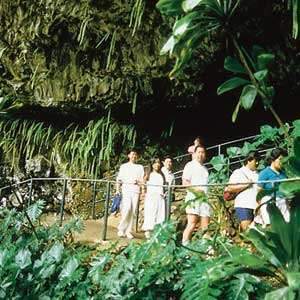 The Hawaii Movie Tours on Kauai is a unique opportunity to experience the island through Hollywood's eyes on an expert guided tour of Kauai's famous movie locations. Enjoy a tranquil boat cruise on Kauai's Wailua River, the only navigable river in Hawaii. 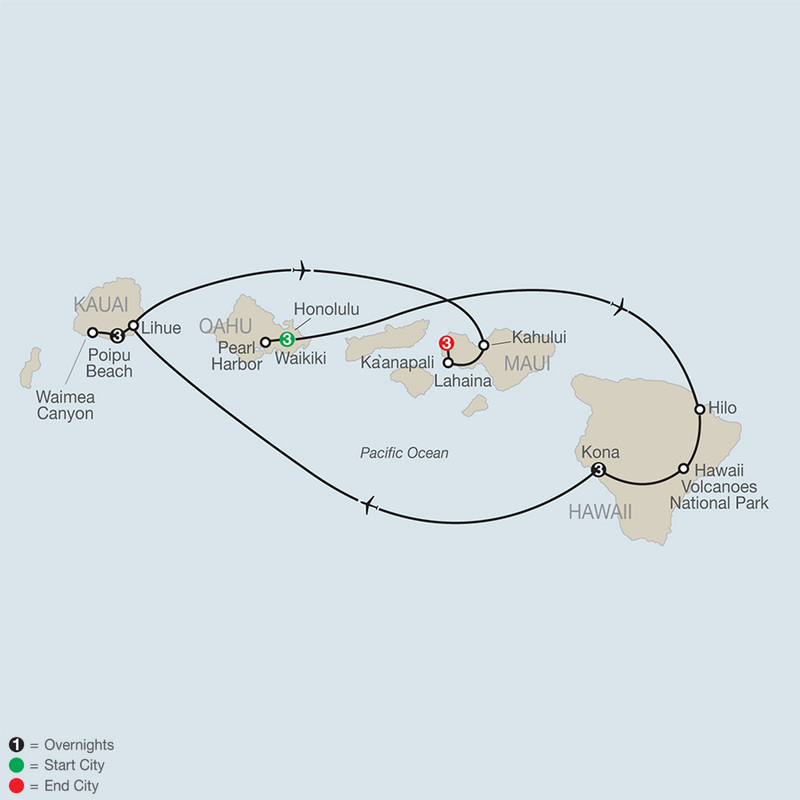 Discover Hana, the jewel of the Valley Isle, on this breathtaking adventure. Visit Haleakala National Park, home to the world's largest dormant volcano with it's majestic views of the crater at 9,740 feet. 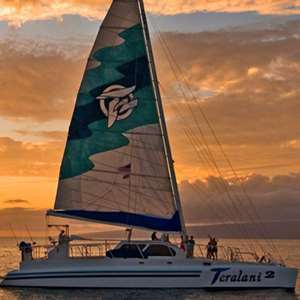 Experience the thrill of trade wind sailing between Maui, Molokai and Lanai. 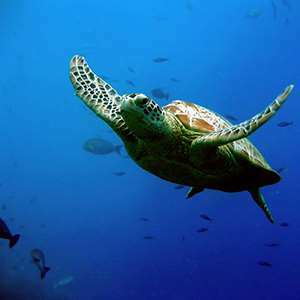 Choose from two of the best snorkeling tours in Maui.